Is your St. Patrick’s Day incomplete without a pint of green beer? If you have been enjoying an emerald-colored beer at the bar year after year and now want to make it at home, it may just surprise you how easy it actually is. Green beer is a novelty that American drinkers have latched onto and it has quickly become the drink to have each and every St. Patrick’s Day. There is something appealing about turning everything green on the Irish holiday and beer just happens to be one of the most popular items to play with. Rumor has it, a doctor created green beer as we know it. Dr. Thomas Curtin, a coroner's physician and eye surgeon, first colored beer for a St. Patrick's Day party at the Schnerer Club of Morrisania in the Bronx in 1914. There is no trick to making green beer and it requires no special bartending skills. It is, quite simply, a light-colored beer that has a drop of green food coloring added to it. The flavor does not change, only the color. It should be noted that if you want to drink like a real Irishman and celebrate the Emerald Isle’s heritage, nothing is more appropriate than a pint of Guinness or a shot of Irish whiskey. There is even a Green Beer Day if you need another reason to drink green beer. Green Beer Day is a day-long party where celebrants drink beer dyed green. The tradition started at Miami University in Oxford, Ohio, and was first celebrated in 1952. It is celebrated annually on the Thursday before spring break. 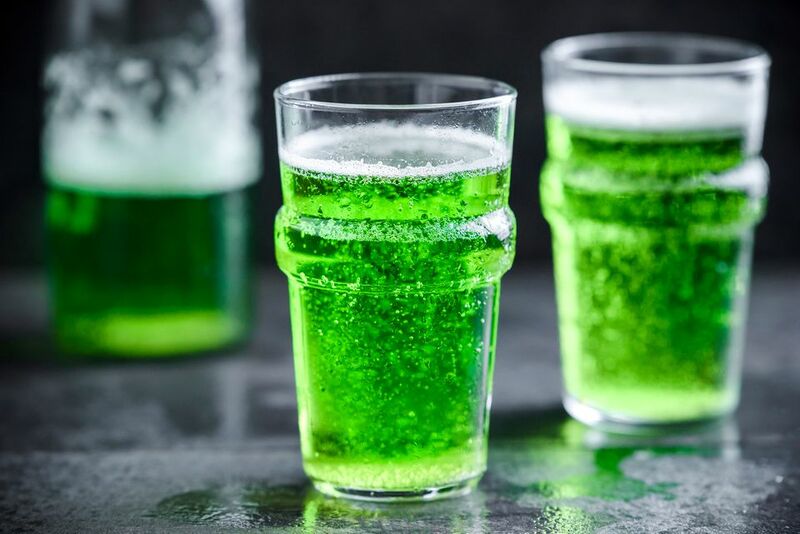 Students begin to drink in the early morning on Green Beer Day; bars in Oxford open at about 5 a.m.
Add one drop of green food coloring to a clear glass. Pour the beer into the glass. That’s it! Any beer will work when making green beer, however, some produce a brighter green color than others. To get the greenest of beers, begin with a light-colored brew. This includes any of the popular American lagers like Budweiser, Miller, Busch, or Coors. Those are favorite beers and, given the novelty aspect of green beer, may be the best choice. However, do not forget about all of the great pale-colored craft beers, the amazing German pilsners, and any of the other higher quality beers that are available today. The beer market is vast and there are many more choices than those from the giant breweries. If you would like to play around with a darker beer, you will find an interesting effect. Stouts and other dark beers have a rich color that is not transparent enough to allow the green food coloring to give that signature emerald green beer look. However, the body of the beer will turn darker and have a slight evergreen hue in the right light. The coolest part is the head because the ​foam will pick up the food coloring and, though it may not last long, take on that green color. Green beer is fun and food coloring is cheap, so feel free to play with it.